A Dentist Discusses Why It’s So Important to Save or Restore Every Tooth! Have you lost any of your teeth? You’re not alone: an estimated 120 million people in the U.S. have lost at least one tooth! And while many people believe that it isn’t a big deal, you might be surprised at how it impacts your overall oral health and self-confidence. In fact, even missing just one tooth causes other problems that cost you more time and money to fix at the dentist later on. Learn more below about the importance of saving your teeth and find out the best way to replace them when that’s not possible! Why Is It Worth It To Save Your Teeth? If you have a tooth that’s been damaged by a cavity or fracture, you might be tempted to have it pulled rather than invest in a restoration to save it. But don’t forget that teeth are hard to come by, so it’s well worth it to save your natural teeth when you can. When Does a Tooth Have To Be Extracted? Thankfully, even when extractions are necessary, there are some fantastic modern options for replacing missing teeth! 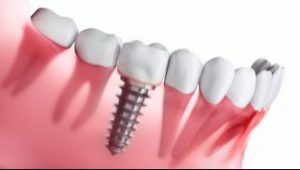 For many patients, dental implants are the ideal choice because they replace the root of the missing tooth. This offers several important advantages such as continued stimulation of bone around the implant similar to a natural tooth root resulting in maintenance of the jaw bone level. It also gives implants their unparalleled support and chewing strength that makes them feel more like your own teeth than any other option. Not to mention that implants can last many decades with basic care and maintenance, which is much longer than options like bridges and dentures. Everyone needs a full complement of teeth to have great oral health. With an option like dental implants, you can restore your missing teeth and look forward to a healthy smile for life! Dr. Travis Cochell is a general, cosmetic and restorative dentist who tries to save his patients’ existing teeth whenever possible. When extractions are necessary, he usually recommends implants because he knows that they’re the next best thing to natural teeth. If you have any additional questions, he can be reached via his website or at (503) 585-8688. Comments Off on A Dentist Discusses Why It’s So Important to Save or Restore Every Tooth!